We have woken up several mornings to the strong smell of smoke. It seems that a good portion of the eastern part of our state is on fire. We are in the middle of a drought and the land is parched and dry. There have been a couple of thunderstorms but they haven’t produced enough long-term rain to wet the land. In fact, lightning is to blame for at least two of the fires. Thank goodness we are not threatened by the fires but we are downwind. So no rain, high temperatures, high humidity means we have been staying at home in the air conditioning most of the week. I have been sewing a bit. I say a bit because most of what I have had to do is hemming the pieces for the parafoil I’m building. And I hate to hem. I’m putting a 1/4 inch hem on all the pieces per the instructions. I’m not good enough at sewing to roll the hem as it goes through the sewing machine. So I have to fold and crease the edges before I sew the hem. Yeech! So I put it off and put it off and now I’m pushing the deadline I set for myself. Finally getting the hemming done, I have started the applique on the bottom panel. That is going so much faster. I enjoy it more and that makes the work easier. I’m hoping that by Thursday I will begin final assembly. And hopefully, flight on the Fourth of July. Sunday there was absolutely no wind. I mean NO WIND. I got to the beach late and there were only a couple of people there. The main activity was standing around talking. There were several Walas and a Laima (both low wind kites) laying on the ground. Even the Breeze by HQ would not fly. 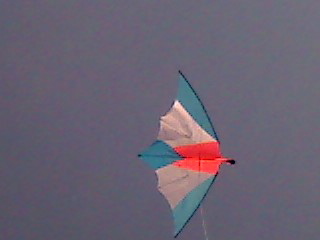 And that is a pretty reliable dual-line low wind kite. I only took one kite out of the car to take with me. It was the Chiroptera, my newest kite, labeled an indoor and ultra-low wind kite. I started flying it on a short line with a wand. I actually got some nice glides and a couple of swooping turns. The wind picked up to about 1 mph and I put it on a spool of line and it flew wonderfully overhead. When the wind let up, it just hovered and drifted and waited for another breath of wind to climb again. 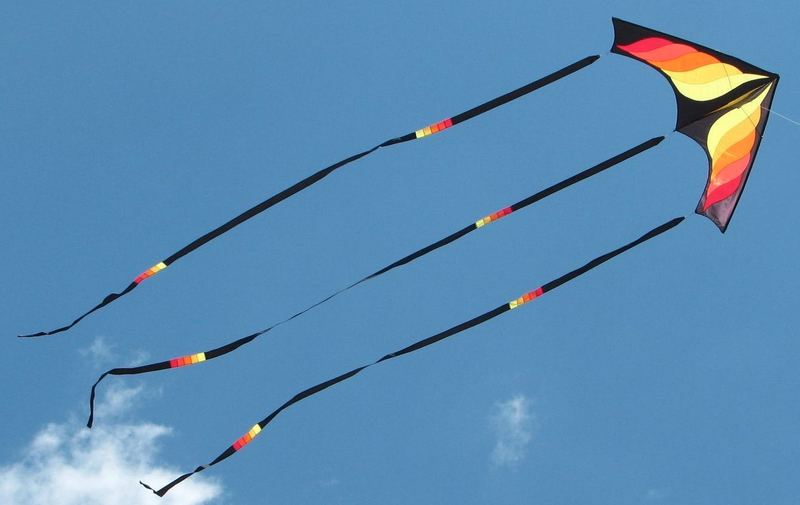 The only kite that would fly that day. Because I came by myself, I did not bring a camera with me. So the only photo I have of the maiden flight of the Chiroptera was taken with a cell phone camera. Not the best but it will do in a pinch. Thank you Will Sturdy for building a great kite. Thank you Barry for the photos.